It’s hard to believe our Spring Style Tour is coming to an end! After 11 days of amazing spring wardrobe inspiration I’m excited to wrap up the tour with two of my own creations. Spring always feels like a new beginning and I was excited to give two patterns on my to-make list a try! 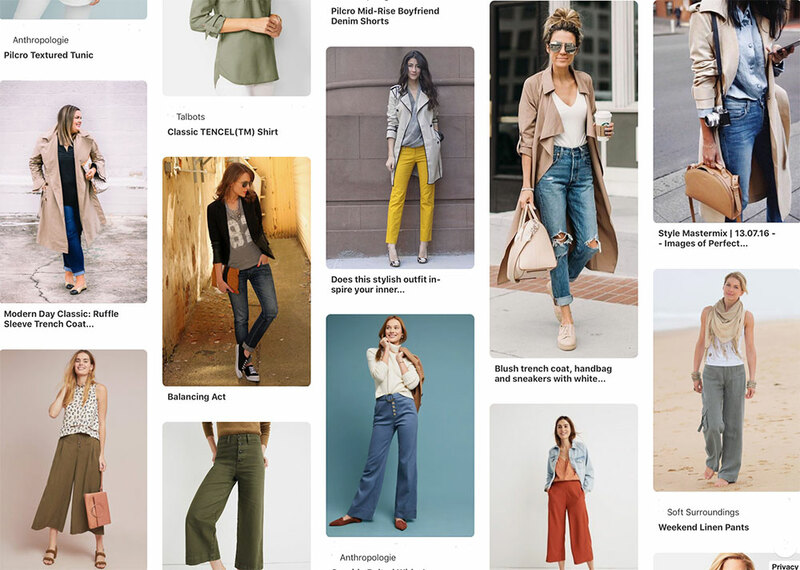 My spring wardrobe brainstorming started back in February while prepping for a talk to give at Sew Expo. I pulled tons of inspiration photos from a lot of my favorite ready-to-wear stores. While they weren’t all exactly my style, it was a great exercise to pulling lots of ideas together and seeing what I liked and what I didn’t. 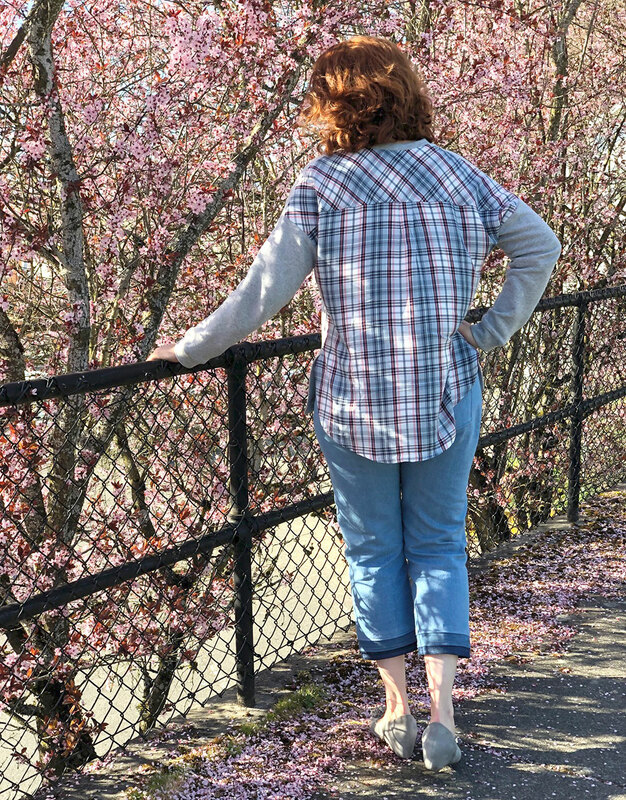 In narrowing down my ideas for what to sew for myself, I kept coming back two two pieces—a pair of cropped jeans and a knit/woven pullover top. Jeans, duh, I live in them so these of course would get lots of wear. And I guess I am always drawn to tops that combine knit and woven fabrics so I should probably have a handmade version in my wardrobe, right? 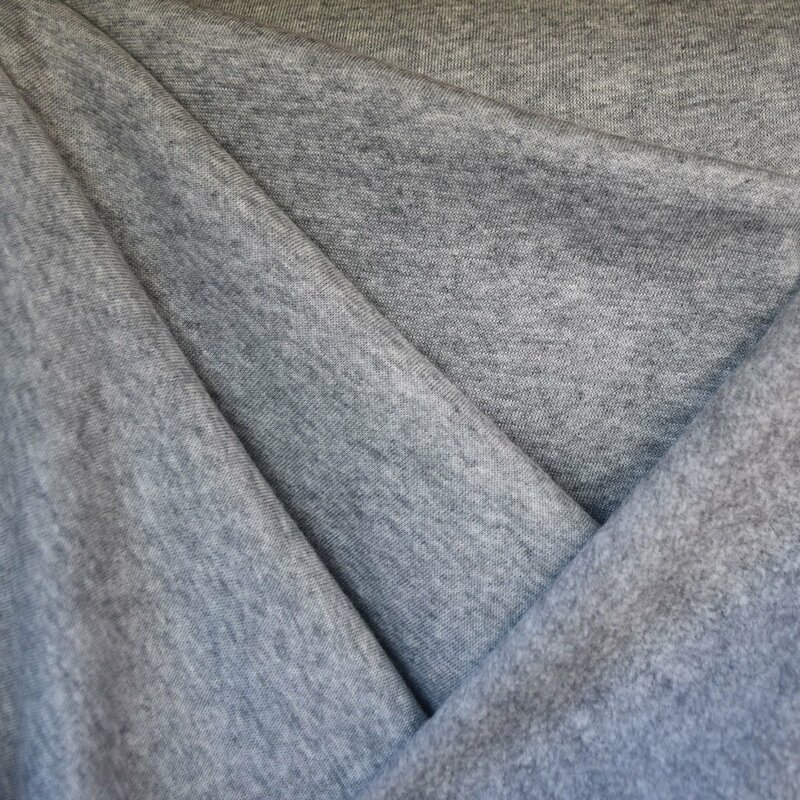 There are so many possibilities and ways to have fun with fabric choices! In selecting my patterns for both of these projects I picked two patterns I have been wanting to try. 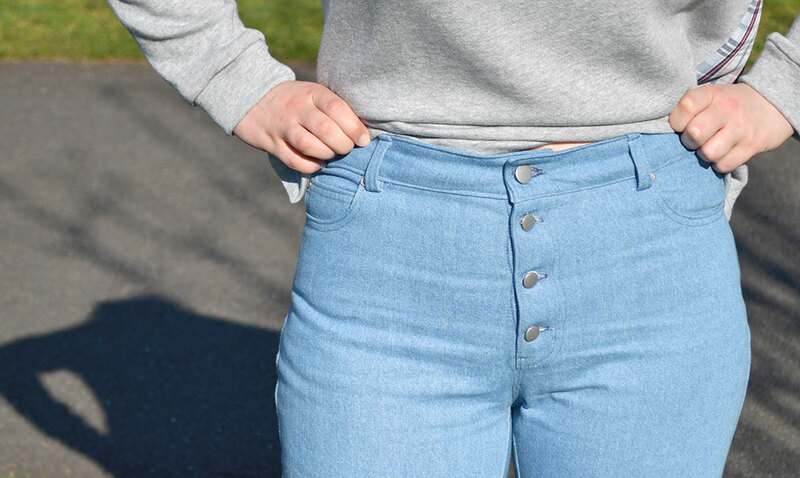 First, a non-stretch jeans pattern. 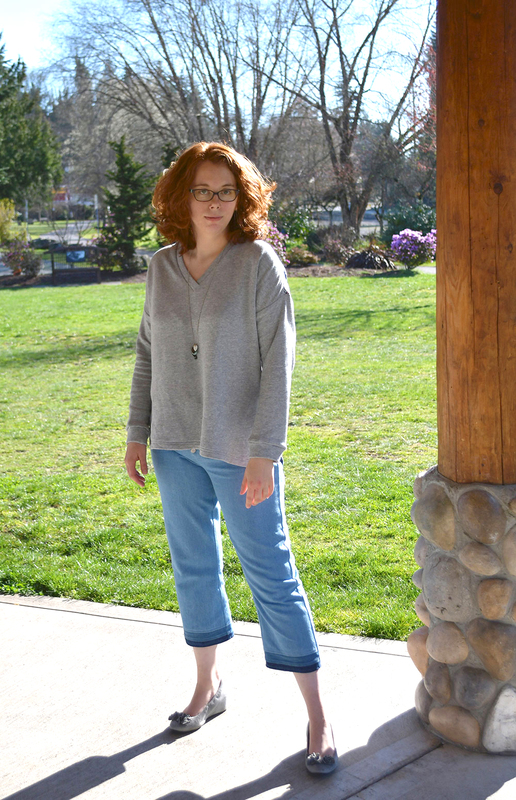 I’ve had Closet Case’s Morgan Jeans on my list, but for this project I went with Megan Nielsen’s Dawn Jeans. Loaded with options in the pattern, this choice let me get right to sewing instead of spending a lot of time making changes to get the look I wanted. 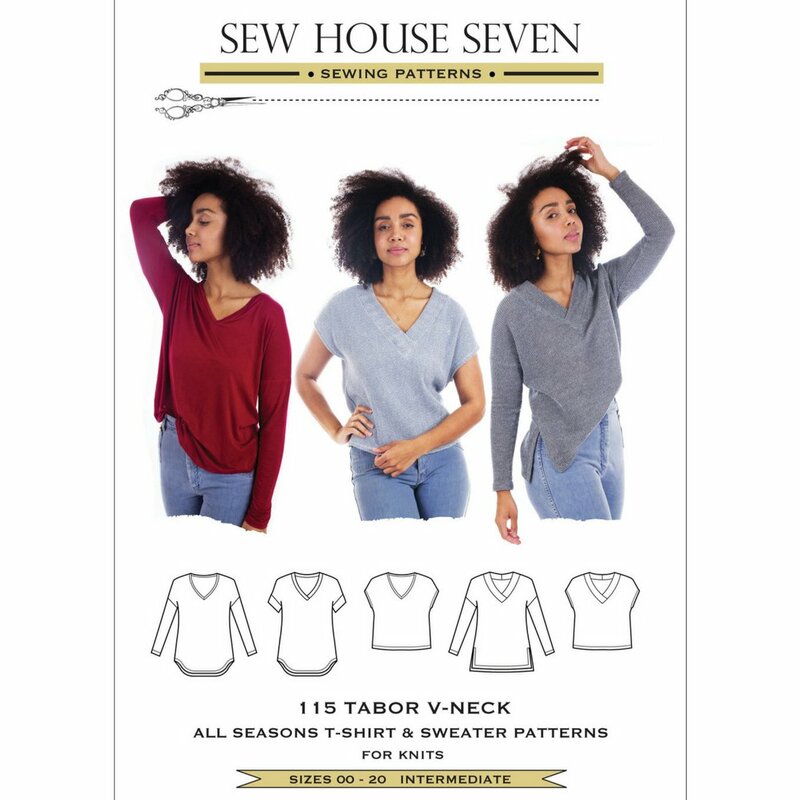 For the top, I went with Sew House Seven’s Tabor V-Neck. The look and style of my inspiration piece made this pattern choice a no-brainer. I also already had it on my sewing table from this winter but I never got around to trying it out. I started with the Dawn Jeans and picked out a washed denim for the main fabric. In looking at the inspiration it appears they distressed, bleached or dip-dyed the jeans to get the gradiated hem. I wasn’t going to tackle that so I also grabbed some scraps of denim ( one | two ) to piece my pant legs and get a similar effect. 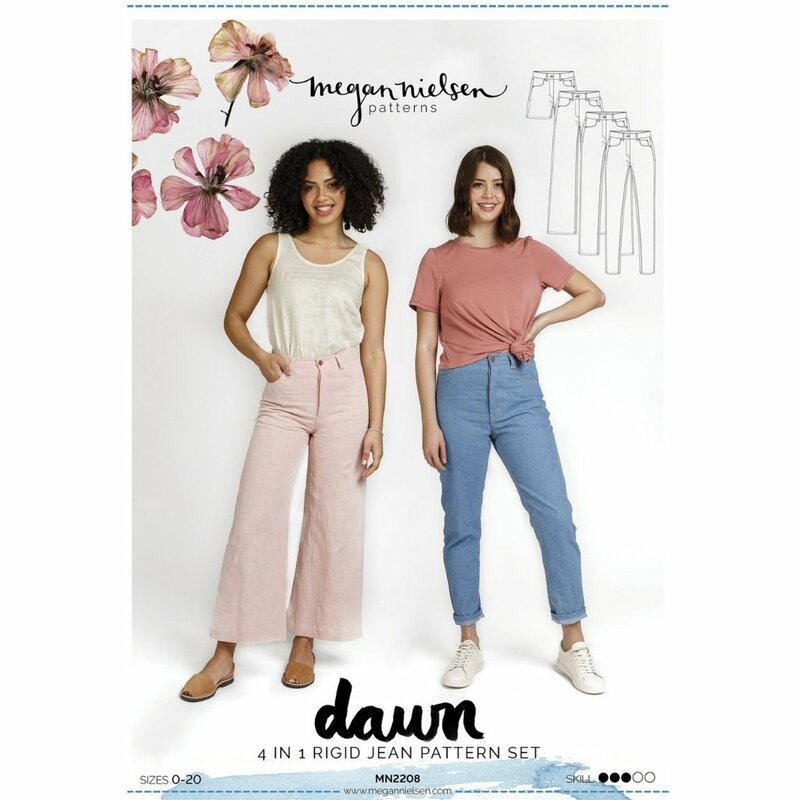 I’m not a huge fan of high-waisted pants so I took at all the amazing resources Megan Nielsen offers on their blog for each pattern and found tips on how to decrease the rise. I ended up picking one size larger than I would have based on my measurements (size 14) and removed 2″ from the rise as described in the post. After basting everything together I did realize I needed to add almost 2 inches to the waistband, I should have done that to begin with and trimmed if needed but luckily I had enough fabric to recut them. Keeping with the inspiration, I followed the included instructions for the exposed button fly and used silver hardware. I picked the straight cut for the legs and initially left them the full length before deciding on how much to cut off while trying on the basted pair. Using some scraps I experimented with my pieced cuff and settled on cutting both shades of denim 2″ x the width of the leg pieces. After 1/2″ seams and a double folded 3/8″ hem I ended up with roughly 1″ of medium denim and 3/4″ of dark denim at the hem. I topstitched all the seams and used a bit of sand paper to give the seams more of a worn, cohesive look. I attached the pieces and topstitched them in place before sewing the legs together but saved the hem for one of the last steps. Overall, I like the fit of my first pair of handmade non-stretch jeans. They definitely loosened up throughout the day and I am anxious to see how they change after wearing them a few of times. The changes to the rise worked nicely and my finished jeans hit right at my navel. I’m going to wait to see how they wear before I make any definite judgments on fit or decide on changes I want to make to the pattern. Now, onto the top! 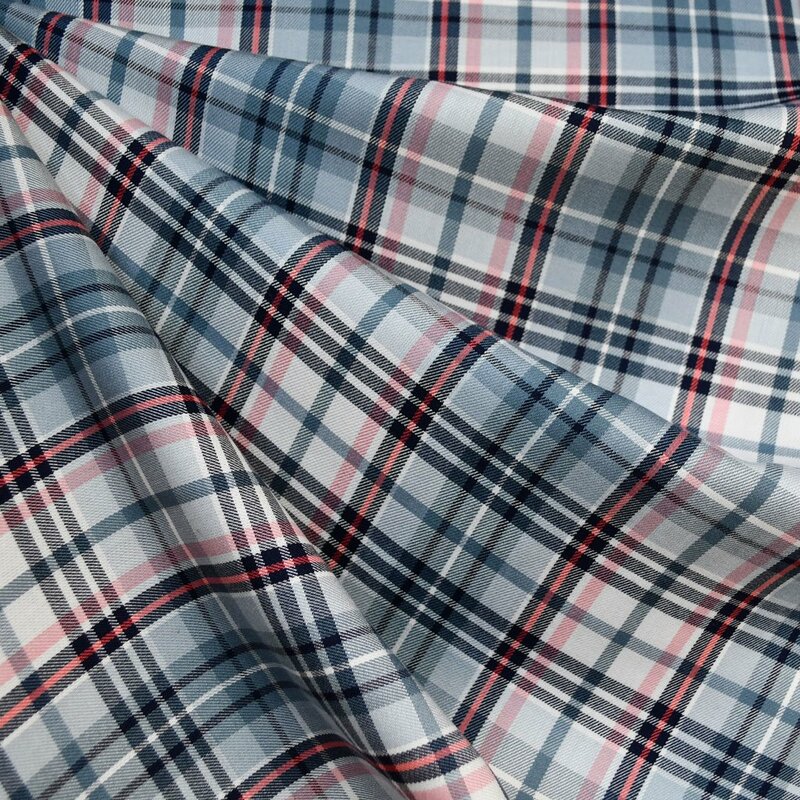 I decided to pick out the woven fabric I wanted to use for the back first. 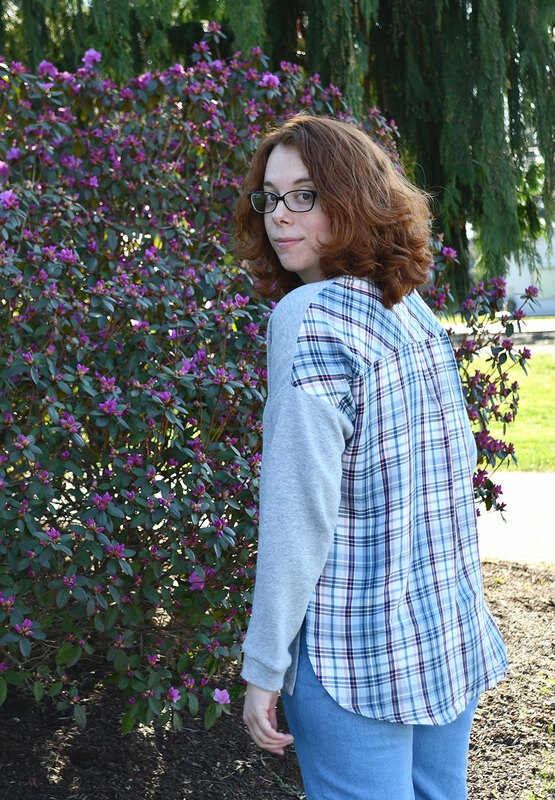 After debating about a few different prints, I settled on a rayon plaid shirting which is in line with my inspiration and I love how the colors worked with the denim. Plus, there is a hint of coral, our favorite color this season! 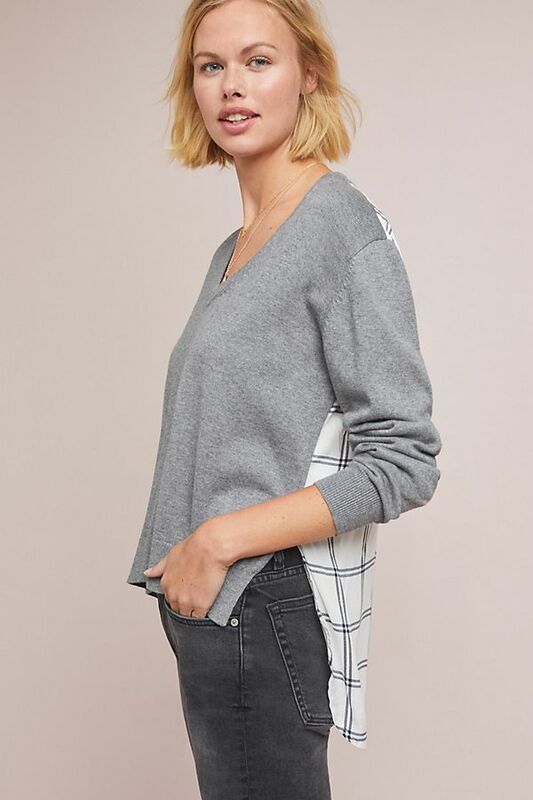 For the body I wanted something cozy but not too heavy and this modal sweatshirt fleece ticked both boxes. 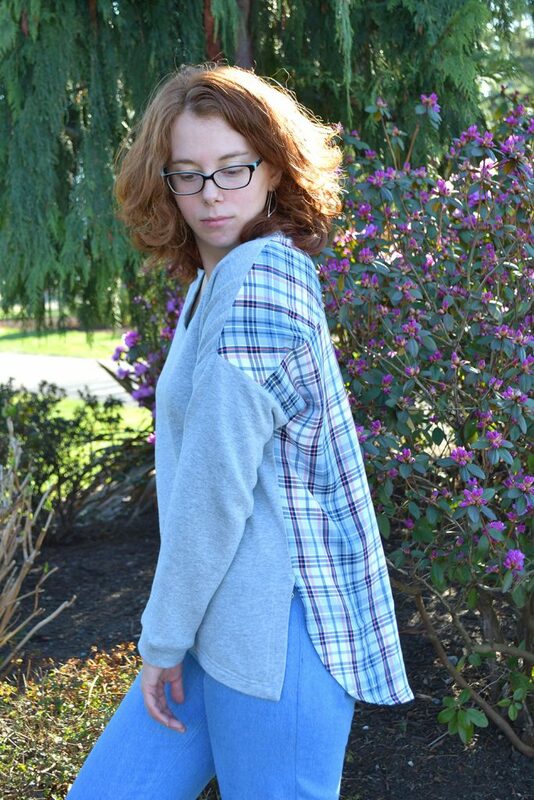 I think our Cozy Eco Fleece would also have been good choice but I liked how the soft heather grey of the modal paired with the plaid. Sewing my Tabor went pretty quickly once I had all my changes made and pieces cut out and the results were even better than I expected. My finished Tabor is not only super comfortable, I also totally achieved the ready-to-wear look I was going for. What do you think? I love the knit/woven combination and the surprise element to the back. I could have cropped the front a bit more but I usually like more length so I think I will be happier with it this way in the long run. The Tabor ended up being the perfect pattern jumping off point for this project and it didn’t require any major adjustments to compensate for the use of a woven. Plus, I really like how it paired with my cropped jeans! I hope you enjoyed our Spring Style Tour as much as I did! I know it got me inspired to get working on a few more items for my spring wardrobe. It is always amazing to see what everyone created and how unique each of their styles are. If you missed any of the tour stops you can find links to all of them in our post HERE. We’ll also get a full recap posted in a few days with links to all the fabrics and patterns that were used. PS Don’t forget! $5 Shipping ends today, April 1st at 11:59pm PT. Any order, any size ships for just $5 within the US. International orders will receive a discounted rate. No coupon code required! 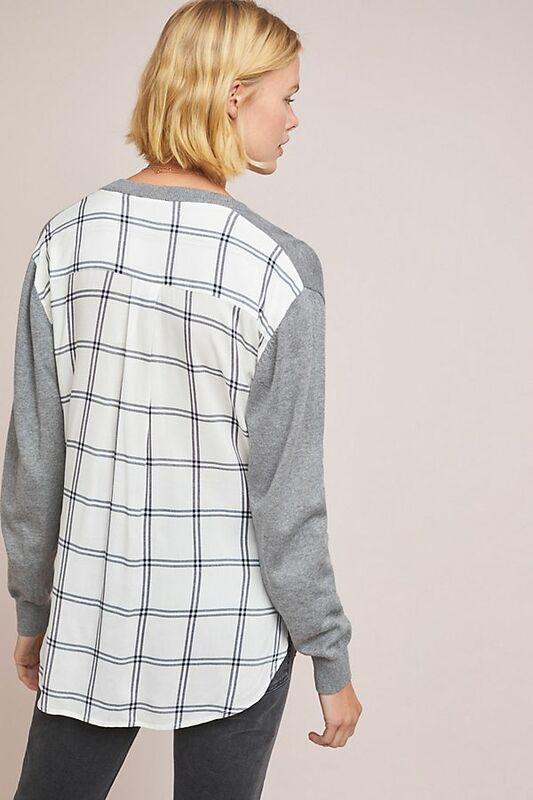 Check out all of our spring new arrivals HERE. Loved this tour, thank you. Michelle! I love your Tabor hack! It really turned out a lot like your inspiration photo and I may have to copy your woven/knit combo idea. It was really fun seeing all the beautiful makes on the tour. Thank you! I love the Tabor with woven knot combo. How did you sew the woven and knit together? Any tips? Thanks so much!